No one intends for their home to be a life-threatening environment. And it’s common that cleaning your dryer vent is among one of the home maintenance jobs that doesn’t get done as much as it should. The longer you go without having your dryer vents cleaned, the more dangerous it will become to you and your home. According to Healthy Living Carpet & Tile Cleaning, dryers are responsible for approximately 15 deaths and 400 injuries per year. If you haven’t had your dryer vents cleaned within the last year, your home could be a ticking time bomb. Call 1st Choice Chimney today. Your favorite, friendly chimney professionals also expertly clean your dryer vents! Your dryer takes longer than normal to dry your clothes. If your dryer takes longer than about 40 minutes to dry a small load, that is a sign that something may not be functioning properly with your dryer vent. Your clothes smell musty and like mildew. If your clothes smell funky, this is from a lack of proper drying. If something is preventing your dryer from letting hot, moist air out, your dryer won’t be able to function properly and will become a major fire hazard. Your clothes are more warm to the touch after a cycle than usual, but still not fully dry. If your clothes run a normal cycle-time, but are still damp and hot to the touch, that is a reflection of inadequate ventilation. It’s been over a year since your last dryer vent cleaning. It is recommended that you get your dryer vents cleaned about once per year. If it’s been several years since your last cleaning, it is a hazard to you and your loved ones. Call us at 1st Choice Chimney. The temperature in your laundry room is hotter than usual. 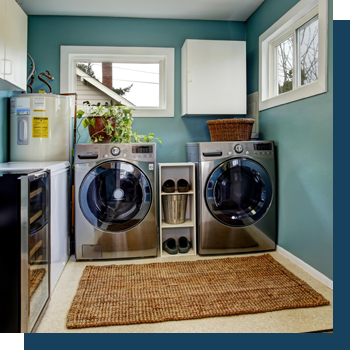 If your laundry room is hot, that is a sign that there is extra hot air that is not being directed through your dryer’s ventilation system properly. This is a dangerous sign, because it means that hot air is circulating your laundry room and could catch fire at any moment. Large amounts of lint are accumulating in the lint trap. 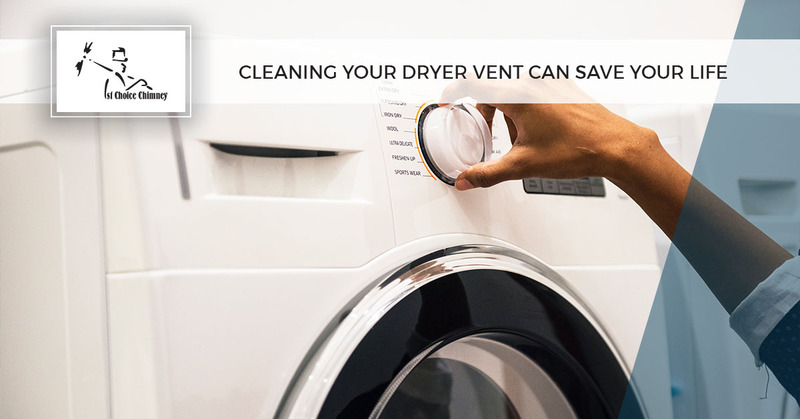 When your dryer vents aren’t cleaned, this means your dryer has to work harder to do its job properly. This will add wear and tear to your machine, and your lint trap will fill up quicker because air isn’t being ventilated properly. If you are experiencing any of these signs, call 1st Choice Chimney today. Your favorite Chimney people are also experts in dryer vent cleaning! We will take away the danger of your uncleaned dryer vent and, as a result, restore your dryer to working condition. Don’t live with a life-threatening fire hazard in your home any longer!